Cambodia & Vietnam Adventure takes you crossing Kingdom of Cambodia to central Vietnam. The trip starts with biking through Angkor temples, horse riding in the Khmer countryside then drive up Northeast of Cambodia to central highland of Vietnam. Price from: $1215 - Book now! Welcome to Siem Reap, the provincial capital and gateway to the ancient Angkor temples. Recognized as a World Heritage Site by UNESCO, the Angkor Archaeological Park encompasses dozens of temple ruins including Bayon, Banteay Srei and the legendary Angkor Wat. Upon arrival, your driver and a tour guide will welcome you at the airport and take you to the hotel to check in. Today you begin your biking adventure through the magnificent Angkor Archaeological Park. Your guide will meet you at your hotel, after tour briefing, warming up and some basic biking rules. Taking a small road cycling out of Siem Reap you will head into the Angkor complex. The tour starts with a visit to the legendary Angkor Wat— the largest Khmer temple and finest example of Angkorian art and architecture—, then pedal to Angkor Thom’s imposing South Gate, topped with the four serenely smiling faces of Avalokiteshvara. Next, visit Bayon temple, the Elephant Terrace and the Terrace of the Leper King. Leaving Angkor Thom by the north gate, we bike to Preah Khan (Sacred Sword), one of Angkor’s largest temples, constructed in the 12th century by Jayavarman VII. Stop for a lunch of delicious Khmer cuisine before visiting the mysterious, jungle-entwined temple, Ta Prohm. Return the hotel and enjoy some free time to relax and refresh. Savor your breakfast at hotel before starting an interesting day. Our driver will pick you up at hotel then transfer you to Happy Ranch. The horses will take you on a journey to places that are otherwise unreachable, through local countryside villages, scenic rice fields. An authentic taste of the real Khmer lifestyle viewed from horseback. After lunch drive to Banteay Srei, home to Angkor’s finest stone carvings, followed by Preah Khan (Sacred Sword): one of Angkor’s largest temples, constructed in the 12th century by Jayavarman VII. On the way back to town, you will watch the sunset in Pre Rup, considered as Mini Angkor Wat. This morning, we depart from Siem Reap on the nice over 2 hour drive to visit Beng Mealea, known us “ Pond of Lotus” Temple dated early 11th Century by Suryavarman II asa Hindu Temple. Beng Mealea temple was hidden in a maze of jungle for hundred of years and recently found and opened for visitors. Climb over large sandstone blocks to reach the inner sanctuary and eerie worship corridor is an exploration to remember. Architecturally, Beng Mealea is noted for its innovative, in its time, construction of hallways, it was a very large temple with wide galleries foreshadowing Angkor Wat. Garudas, hold up an outer platform, finer in detail than those to be found out in the elements of the Elephant Terrace at Angkor Thom. Surprises of fallen lintels with intricate carvings lay amongst the fallen wall and roofs. Continue over an hour drive, we get to Koh Ker, a 10th century capital abandoned in the remote north of Cambodia for more than a thousand years. Enjoy a visit to the pyramid temple of Prasat Thom. Continue to explore the many temples at this incredible site, including the beautiful Prasat Krahom covered by jungle. Accommodations: Hotel in Preah Vihear. Have breakfast in the hotel and we leave early heading North on the bumpy road to Preah Vihear. Some part we got to use the special transfer of Preah Vihear complex. Once you get to the Temple, enjoy the panorama view over the Thai border and discover the unique architectural complex of a series of sanctuaries linked by a system of pavements and staircases on an 800 meter long axis, is an outstanding masterpiece of Khmer architecture, in terms of plan, decoration and relationship to the spectacular landscape environment. Situated on the edge of a plateau that dominates the plain of Cambodia, the Temple of Preah Vihear is dedicated to Shiva. Nevertheless, its complex history can be traced to the 9th century, when the hermitage was founded. This site is particularly well preserved, mainly due to its remote location. The site is exceptional for the quality of its architecture, which is adapted to the natural environment and the religious function of the temple, as well as for the exceptional quality of its carved stone ornamentation. In the afternoon, we drive about 4,5 hours to Steung Treng – a unique province quite distinct from other Cambodian provinces in the Mekong basin. Extensive forests, intersecting rivers and streams and low population density characterize it. After breakfast, you visit open market in Stung Treng to see local people selling fresh vegetable, meat, fish, snake, fruit etc… Then you continue to visit Banlung town, Ratanakiri where there are a lot of natural, cultural and historical resources. Upon arrival at the town, check in and enjoy lunch at local restaurant. After lunch, you visit Yakloam Lake, the Crater Lake and unique lake in Cambodia. It was formed by volcanic eruption around 4000 years ago. The lake is about 50m depth and is a good place for relaxing, swimming and panoramic view surroundings. After breakfast at the hotel, your driver and guide will take you to Kalai Community Park for a trekking day. You drive about 17 Km towards one of the indigenous villages which give us a superb view. The hike starts by going down a trail and then crosses a few fields before progressively entering the forest. This timber forest is exported by local villagers for the first kilometre of the hike. We cross a number of streams, some of small rapids in the shade of the forest. The hike is usually easy but can be more difficult when trees have been fallen or when the tracks go up a slope. If we wish for more sport, it’s possible to go towards a small waterfall by leaving the track and cutting through the forest. The hike to get there becomes much harder and one must often use a machete to make ways through the bush and thorns. The first slash and burn fields that you encounter mark the quick ending of the forest as a mater of fact. Half an hour later, you reach the road where your car is waiting. You return to our hotel later in the afternoon. After breakfast, we do some souvenir shopping at Banlung Marekt and then drive directly to O'yadaw/Le Thanh border gate to Pleiku - a city in central Vietnam. Arrive in Pleiku, check in hotel. After a short rest, visit the Minh Thanh Pagoda and the T’Nung Lake which is situated on the mouth of a volcano of million years. Continue the journey to visit the Plei Phun Village to learn more about the multi-cultures & the traditional customs of the Jarai. Go back in Pleiku and have free time at the rest of the day. After breakfast at your hotel, you will leave Pleiku for drive to Kontum. Visit Wooden Catholic Church. The construction was combined between the Roman style and the Bahnar stilt house. The Catholic Seminary houses a small minority museum and colonial-style building itself is well worth a visit. After lunch time, drive to Konkotu Village which is the representative of Bahnar group in Kon Tum. It located around 11km from the City, crossed over a suspension bridge to another side of Dakbla River to the East. Konkotu is right on the bank of that river. As other Ethnic tribe, Bahnar group attached their life to mountain and forests. Bahnar people like dancing and playing a great number of traditional instruments. Return Pleiku in the late afternoon for overnight stay. You should go to bed earlier as tomorrow is a long drive day. 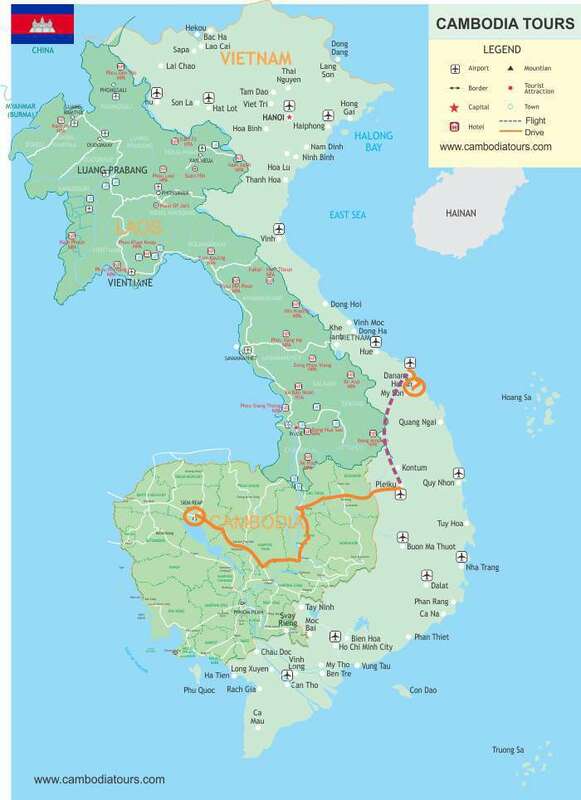 Today you will be escorted by your driver and guide by 8 hours drive on a private car to Hoian. Along the way, you can stop to take photos. Arrive in Hoian, check in hotel. Free and relax. Immerse yourself in the tranquility and charm of this sleepy riverside town. From the 16th to 18th centuries Hoian was a thriving international port frequented by Chinese, Dutch, French, Japanese, Portuguese and Arab traders, who came to trade in the high quality silk still produced in the region. Today, Hoian is a relaxing resort popular with tourists for its eclectic architecture, skilled tailors and numerous cafes. Take a half-day walking tour through the narrow winding streets of the ancient town centre, visiting Chua Ong Pagoda, the Chinese Assembly Hall, the 200-year old Tan Ky ancestral house and the famous Japanese Bridge. After lunch, take a short boat trip to a nearby island and visit a handicraft village specializing in ceramics. Return to the hotel in the late afternoon and enjoy a free evening at your leisure. Farming & Fishing the very special tour which is promised to bring visitors the most beautiful sceneries of the countryside of the Farmer and Fishermen life in Hoi An town - Viet Nam. By exploring the typical and narrow roads along the countryside by bicycle to see such as water buffalos, rice paddle field, plenty of organic vegetables and local farming people, you will be amazed to realize how peaceful sceneries and friendly people are. Touching into the local fishing life by using the fishing net, riding funny basket boat and visiting water palm coconut paradise and learning about history about the Vietnamese people throughout daily activity is a great thing to experience. From Farmer to Fisherman tour will be the special and unique tour that is committed to providing you "A unique cultural window into the Vietnamese way of life"
Our Farming & Fishing Life Tour provides you with a close-up and intimate exposure to both the local farming and fishing communities. Accompanied by your tour guide, you commence the day leisurely cycling along country roads witnessing local Vietnamese rural life first hand, discovering all manner of photo opportunities - maybe a water buffalo working in a rice paddy field; seeing ducks swimming along the rice farm or farmers tending their crops. The photo opportunities are endless. As well you will experience the friendliness of the local people greeting you along the way. Later you will board our Hoi An Eco-tour boat for a river cruise to meet and engage with local fishermen and enjoy a hands-on experience of traditional net fishing. You will also experience paddling the unique Vietnamese bamboo basket boat while exploring coconut-palm flanked waterways. This tour provides you with a cultural window into the ways of life of both our farming and fishing communities. You have another free day to explore Hoian on your own. Have breakfast at hotel then enjoy a free morning before driving to the airport to catch your departure flight home.